With the weekend and holidays fast approaching, everyone is getting ready for well deserved time off to spend with family and friends. Are you looking for something fun to do? There are so many great events going on this weekend. Let this be your guide to locate fun events in the area. Fans of Hogwarts have been waiting a long time for the last installment of the Harry Potter series. On Friday, November 19, “Harry Potter and the Deathly Hallows, Part I” will premiere. Experience it on MOSI’s IMAX Dome, the largest screen in Florida. 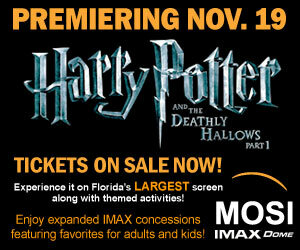 You can also enjoy Harry Potter Themed Activities at MOSI from 11/19 to 1/2/2011. Come out and experience First Year Astronomy, Transfiguration, Science in the Wizardry World, Potion Shop and Borgin & Burkes Creepy Shop. For tickets and information, please call 987-6000 or visit www.mosi.org. Outdoor ice skating in Florida?! Yes, at Curtis Hixon Waterfront Park in downtown Tampa from November 19 to January 2, 2011, you can enjoy ice skating on real ice. 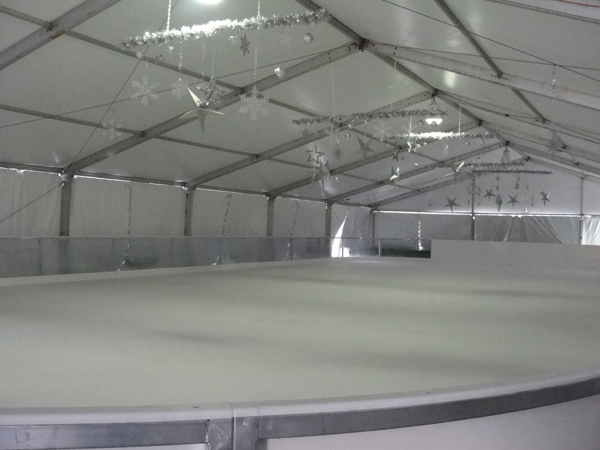 Admission, including skate rental, is $10 for 90 minutes. The rink is open daily (closed on Thanksgiving) Monday to Thursday 11 a.m. to 8 p.m.; Friday and Saturday from 10 a.m. to 10 p.m.; and Sunday 12 to 8 p.m. For more information please visit, www.tampasdowntownonice.com. Do you know your adjectives, nouns and verbs? Center Place and Stages Productions will help you remember them with their presentation of “School House Rock” on Friday, November 19 at 11:45 a.m. and 7 p.m. Center Place is located at 619 Vonderburg Dr. in Brandon. Admission is $6 for members and $7 for non-members. For information call 685-8888. The Apollo Beach Chamber of Commerce will host the 16th Annual Apollo Beach Manatee Festival of the Arts Silent Auction on Friday, November 19 at the Tampa Sailing Squadron Clubhouse located at 1250 Apollo Beach Blvd. in Apollo Beach from 6 to 10 p.m. Tickets are $25 per person or $35 per couple. For more information, please call Joanne Gadek at 645-1366. Looking for something fun and local to do? Check out The Frenzie’s First Fa-La-La Faux Show presented by The Frenzie Life Theatre on Friday, November 19 and Saturday, November 20 at 8 p.m. Tickets are $8. The show is at the historic James McCabe Theatre located at 506 5th St. in Valrico. For more information, please call 655-0789 or visit www.thefrenzie.com. The David A. Straz, Jr. Center for The Performing Arts in Tampa presents “Dreamgirls” on November 19-21. Shows are Friday at 8 p.m.; Saturday at 2 p.m. and 8 p.m.; and Sunday at 2 p.m. and 7:30 p.m. For tickets call 229-STAR (7827). Bring your pet and have a professional photograph taken with Santa Clause at Give A Dog A Bone located at 6170 N. U.S. Hwy 41 in Apollo Beach from 2-4 p.m.. This is a fundraiser for Critter Adoption Rescue Effort (C.A.R.E.) hosted by Dr. Kim Tyson of Four Paws Veterinary Hospital. The cost is $15 per sitting fee. For more information call Dr. Tyson at 672-3687. Music fans and race fans alike will have fun at the South Shore Music Festival on Saturday, November 20 from 10 a.m. until 11:59 p.m. at the East Bay Raceway. You can enjoy a fun filled day being entertained by five local bands, stand up comedy, games, raffles, 50/50 and a night of racing. Tickets are $10/child and $20/adult. This is a fundraiser for Hand to Hope. For more information, please contact Mike Self at 690-2201 or visit www.southshoremusicfest.com. Are you looking for a fun event that supports a great local organization? The Brandon Area YMCA’s present Corks and Forks 2010, “Night of Magic” on Saturday November 20 from 7 to 10 p.m. This magical event will be held poolside at the Campo Family YMCA located at 3414 Culbreath Rd. in Valrico. Tickets are $50 for members and $75 for non-members. For information, please call 684-1371 or visit www.tampaymca.org. FAOPA, Music Showcase and the Jr. Showcase Players will present “Annie” on Saturday, November 20 and Sunday, November 21 at Music Showcase located at 402 Oakfield Dr. in Brandon. For tickets and information call 685-5998.